SINGAPORE (Reuters) - Singapore on Wednesday announced stricter guidelines on the maximum number of units in new blocks of private flats and condominiums in a move to tackle what authorities have called "excessive development of shoebox units" in the island-state. 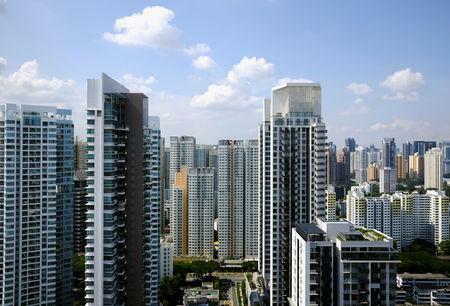 Singapore this year unveiled its strongest property cooling measures in five years, including extra taxes on developers that had been paying record sums to buy land for residential use. "With the revised guidelines, developers are encouraged to provide a wide range of unit sizes that will cater to the diverse needs of all segments of the market, including larger families," the Urban Redevelopment Authority said in a circular posted on its website. "The guidelines will also help moderate the reduction in dwelling unit sizes, safeguard the liveability of our residential estates and ensure that the local infrastructure will not be overly strained." Under the revised rules, the maximum number of dwelling units per development will be calculated by a proposed building's gross floor area divided by 85 square meters, division by 70 square meters currently. The new rules have also added more areas where the maximum number of units are calculated by total area divided by 100 square meters.